Barefoot Massage technique dates back before recorded history with roots from various parts of India, Japan, and Fiji. Nowadays, we’re only aware of a handful of the original Barefoot techniques. So, what are the benefits of barefoot massage for the client and the therapist. And what are the different barefoot methods? What are my best training options? Benefits of Barefoot Massage for Client. By adding Barefoot Massage to their list of techniques, a therapist gives more options to their clients including the choice of the deepest massage possible. The great thing is, the effects of these deep tissue techniques last longer than traditional massage and clients have less residual soreness. In a regular massage, dual massage cream starts off slick to apply effleurage strokes, but then dries and become sticky. This cream is necessary and helps the massage therapist get a better grip to apply deep tissue work. Unfortunately, it also tends to pull on excess hair, sometimes removing it completely. As one can imagine, this is very painful for customers. With Barefoot Massage, clients that have a lot of hair can get a deep tissue massage without having their hair pulled out by the roots. Most massage therapists limit their daily treatment sessions to decrease fatigue and over-use injuries from too many massages. Ashiatsu, Fijian and Barefoot Stretch massage puts an end to these such issues. Not only do they make for a diverse menu of services, but they also save a therapist’s hands by giving them a rest. By employing Ashiatsu, Fijian and Barefoot Stretch massage modalities, therapists can give clients the deepest deep tissue massage possible. Also, these modalities offer new ways to promote their business as these techniques take their abilities to a higher level. Lastly, outdoor events are no longer a hassle. Sweaty athletes? Not a problem! Therapists can use their feet at sporting competitions. They only need to bring a canister of antibacterial wipes for easy sanitation. Additionally, draping is not an issue. If a therapist doesn’t want to lug any equipment or lotion, Fijian massage is the best approach to utilize. The Portable Ashiatsu Floor Bars are definitely an eye catcher, but are not anecessity. What are the 3 Barefoot Massage Techniques? For the record, Ashiatsu, meaning, “foot pressure,” is a technique that uses overhead Ashiatsu bars or Portable Ashiatsu floor bars. These bars are essential tools for the therapist as they help maintain balance. 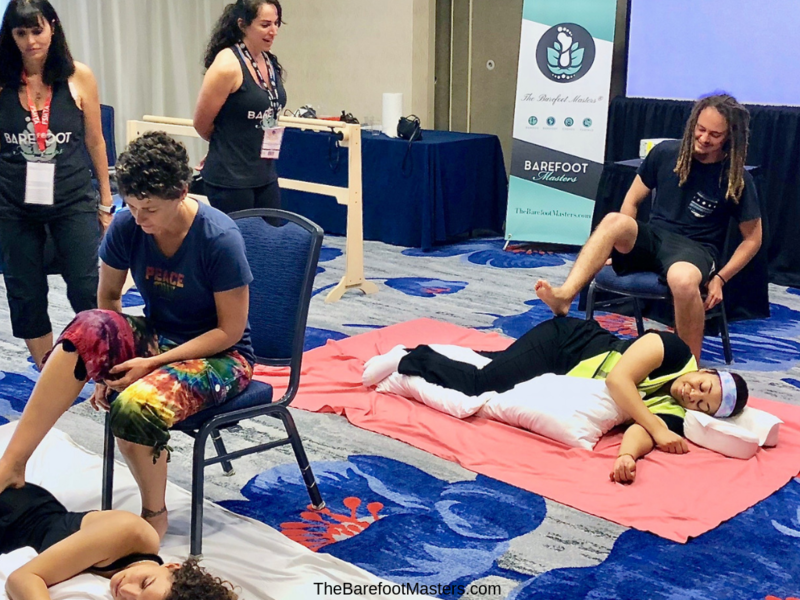 The Barefoot Masters® instructor Tiffany Diaz shows how easy Ashiatsu Seated Massage can be applied. In a typical treatment, the therapist first applies lotion (not oil) to the client’s body. After the lotion application, the practitioner stands on the massage table or floor and begins the treatment by using the soles of their feet to apply deep, gravity-assisted effleurage strokes. Ashiatsu is more like Myofascial structural integration and compression massage all in one. The feet slowly glide over the contours of the body in long deep strokes. Ultimately, when performed correctly, the client cannot tell if the practitioner is using their feet or hands. Fijian Barefoot Massage originates from the Fijian Islands, in particular the island of Kadavu, which is one of the 300 islands in the Fijian chain. In this remote part of the world, communication and travel was very limited. In the event of an injuryor ailment, the only person who could help was the village doctor. During a Fijian Barefoot Massage, the islander would lie on a weaved mat while the practitioner would attempt to eliminate the illness by massaging them with their feet. At the time, these treatments were a critical necessity for the community. Michelle Mace teaching students how deep Fijian Barefoot Massage Technique really is. In comparison, Fijian Barefoot Massage needs no lotion or special equipment. The client lies on a mat while dressed to receive this deep tissue approach. For this method of treatment, the only tools necessary are a mat, stool, and face cradle. In addition to these tools, a pillow can be used to support the client’s knees and make them more comfortable. Additionally, Fijian Barefoot Massage, movements are small, precise and detailed. It is more like neuromuscular massage but implemented with the foot instead of the hands. So, the heel of the foot makes trigger point work a breeze as it methodically works each muscle. Therapists can use this type of massage to cover the posterior, anterior and side-lying positions of the body. Barefoot Stretch is a combination of many different modalities, namely Barefoot Shiatsu,Thai stretch massage, and various westernized techniques. In Japanese Barefoot Shiatsu, which should not be confused with Ashiatsu, therapists use their feet to apply stretches to the muscles. In Thailand, Thai stretch massage, a therapy that originated in India, presently has over 300 variations of Stretch Massage. Since lotions are not used, clients remain clothed to avoid draping mishaps, though this is not a set rule.To improve structural imbalance and decrease muscular discomfort, Barefoot Stretch massage techniques loosen tight muscles and restore flexibility. As the name implies, Barefoot Stretch massage is all about stretching, and is a truly unique technique that is incomparable to other types of massage. This approach necessitates the use of Ashiatsu overhead, Ashiatsu Portable Floor bars for balance or the back of a chair. Which is the best approach? The fact is, the more massage techniques a therapist knows, the more tools they’ll be able to use to help their clients. In the end, a practitioner’s job is twofold: they must take care of not only their clients, but themselves as well. Therefore, it makes sense to learn as many massage types as possible. In turn, they are able to call on appropriate techniques in any given treatment setting. As far as massage approaches go, there is no doubt that eastern therapy techniques have been around for much longer. In addition they hold a precious amount of knowledge. Of those, Barefoot Massage is one of the oldest, deepest, and by far the most practitioner-conscious. By learning Barefoot Massage, therapists have a significant impact on their massage practice. Since they are able to provide a greater number of services to a greater number of individuals, it raises their income. All the while keeping their body healthy by employing an ergonomic, body-conscious, versatile approach. Where do I get training? The Barefoot Masters® is the largest barefoot provider in the country. We offer the many options for Barefoot Massage training. With 35 instructors there are plenty of live courses going on every week. We also give training in a home study and online platform. All of our course come with CEU and certification. Thanks for read our article on the Benefits of Barefoot Massage Techniques and Training. Also, to show our appreciation we have a special free download “How to Go Mobile with Barefoot Massage”. Let us know how we can get your best foot forward in an exciting barefoot career. Not sure, we have a new course called “Intro to Barefoot Massage” that will introduce you to all three different techniques, so you can choose what fits best for your needs.